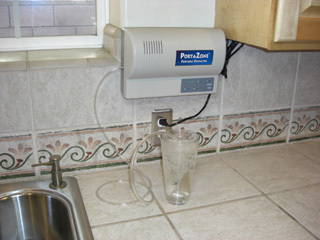 Ozone - The "Master Sterilant"
Ozone generator for water, oil, & air! This is the ozone generator that Dr. Clark talks about in her books! It's the ONLY unit on the market built in corroboration with, and tested, by Dr. Clark! Ozonate your water, olive olil, foods, foot soak, laundry, and more! A crucial part of Dr. Clarks’ protocols! Ozone (O3) is the triatomic form of oxygen (O2). It is oxygen in it's most active state and is an extremely potent oxidant that has been shown to posses broad spectrum antimicrobial activity. Ozone is not just another disinfectant. Ozone is a true sterilant. It has the ability to completely destroy not only bacteria, but also viruses, spores, fungus, mold, mildew, cysts, and many other contaminants while at the same time breaking down dissolved organic materials by oxidation. When ozone (O3) breaks down it naturally reverts back to oxygen (O2). How Does the PortaZone Work? 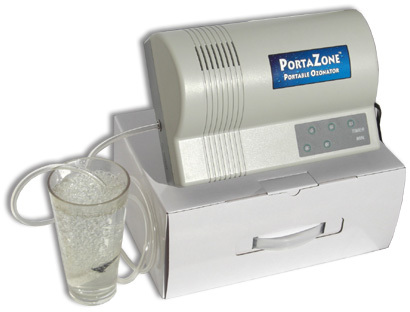 The PortaZone™ Ozonator uses ordinary air from the environment, which contains approximately 20+% oxygen. This ambient air is drawn by a pump and then channeled through an "ozone chamber" inside the unit. The corona-discharge element provides a capacitive load. Ozone is produced from oxygen as a direct result of electrical discharge. This corona discharge ruptures the stable oxygen molecule and forms two oxygen radicals. These radicals combine with oxygen molecules to form ozone. 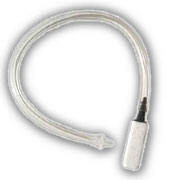 To control and maintain the electrical discharge, a dielectric is present. The ozone then travels through clear, ozone-resistant tubing with a diffuser on the end. By placing the diffuser in a container of water you will see the ozone gas escaping into the water. The strong distinctive smell verifies the presence of ozone. The PortaZone will put out approximately 250 mgs of ozone per hour. Where Is The Oxygen Tank? No separate oxygen tank is needed to produce ozone in this manner. The PortaZone™ Corona Ozone Generator can be wall mounted or used on the coutertop. It is fully portable and comes with a travel/storage box. Ozone is approximately 3,500 times more potent an oxidant than oxygen. Bacteria, molds, fungi and even mildew are destroyed when they react with ozone as the outer membranes or ‘shells’ of these micro-organisms contain receptors that absorb ozone to their own demise. Viruses can also be destroyed by ozone on contact, including HIV. In the case of polio only 0.012ppm removes all viral cells in seconds. In cleaning water, ozone is more efficient even than chlorine. In fact, an ozone level of just 0.04ppm in just 4 minutes has been shown to kill 99.9992% of all pathogenic germs in the purification of water while destroying 99.9992% of all pollutants in the water simultaneously! Cigarette smoke has over 4,000 chemicals. Ozone will break ALL those chemicals down into their basic molecular components, neutralizing them. It is capable of destroying tar, soot and oil in the lungs.... benzene, vinyl chloride and other hydrocarbons. Having performed this task the ozone itself reverts to just plain oxygen! In 1896 Nikola Tesla patented his first ozone generator and went on to form a company selling ozone machines to doctors. Tesla made ozonated olive oil and sold it to naturopaths, just as we do today. "Ozone eliminates... viruses and bacteria from blood, human and stored... Medical ozone is successfully used on AIDS, Herpes, Hepatitis, Mononucleosis, Cirrhosis of the liver, Gangrene, Cardiovascular Disease, Arteriosclerosis, High Cholesterol, Cancerous Tumours, Lymphomas, Leukemia... Highly effective on Rheumatoid and other Arthritis, Allergies of all types... Improves Multiple Sclerosis, ameliorates Alzheimer's Disease, Senility, and Parkinson's... Effective on Proctitis, Colitis, Prostrate, Candidiasis, Trichomoniasis, Cystitis; Externally, ozone is effective in treating Acne, bums, leg ulcers, open sores and wounds, Eczema, and fungus." Quote from the international MD's assembled at the May 1983 Sixth World Ozone Conference in Washington, D.C. There are many uses for an ozone in your life. For therapeutic use: Place the diffuser in a glass or container of water. Plug in the unit and run for 2-4 minutes per 8 ounces of water for best saturation. The time it takes to ozonate a glass of water depends on what kind of water you use and what strength water you want. Distilled water is for example is reported to hold more ozone than tap water. Keep in mind that water can only hold so much ozone, so no matter how long you ozonate it past 4 minutes, it will not get stronger. (This is not the case with olive oil.) It is best to ozonate a glass at a time and drink quickly, as ozone will dissipate from the water within 15-20 minutes. For general sterilization of drinking water: Ozone is extremely effective at cleaning water. It can be used to make tap water 99.9999%+ pure and free of toxic chemicals, metals, bacteria, etc.., then stored for when you need it. Just fill a jug of water, ozone it for 5-7 minutes, then stcik it in the frig, cupboard, or countertop. Remember, the ozone will not remain in the water for much longer than 20 minutes. You're left with clean, pure drinking and cooking water. There is an tube extension with a diffuser on the end especially for ozonating olive oil. To use, remove the diffuser on the end of the tube then add the extension tube with it's own diffuser on the end. Place the diffuser into the olive oil and ozonate for 25 minutes. Do not use the same diffuser for olive oil as you do for water. Drink 1 Tablespoon 2 to 3 times daily, for up to 3 weeks for chronic conditions. For ongoing "maintenance", just tablespoon very few days is a good idea. You can place your grocery bag into a large plastic bag and then stick the hose with the ceramic aerator on it and ozonate the entire grocery bag(s) with all the produce in it for about 3 minutes. Another method, that can be used in addition to the first one, is to fill up your sink (or large bowl) with water. Place the unit a safe distance from the sink and place the diffuser in water. Plug in the unit and run for 2-3 minutes. Place fruits, vegetables, eggs, meats, etc. in water with unit still running. Brush and cleanse foods thoroughly while they are being ozonated for another 2-3 minutes. Remove foods from water and air dry. Your produce will stay fresher longer and taste better! Use a bag, shoe box or glass jar to ozonate grains, breads, nuts or other dry foods for 2-3 minutes. The PortaZone may be used to eliminate odors, molds and mildew from many different small areas in your environment. Just place the diffuser (the diffuser can also be removed) into the area to be treated, close off the area and ozonate for up to an hour. Some areas may require several treatments to be effective. PortaZone™ Corona Generator - Only $289! Guarantee We will repair or replace (our option) defective units for free, for up to one full year from date of purchase (save receipt). Standard aerator for olive oil, drinking water, bath water, or washing produce. This is the Aerator that comes with the unit. It is a fine-pore ceramic diffuser intended for water OR oil purification. This diffuser can be cleaned but should be replaced every 6 months or so depending on use and your water. You need an ozonator to use this aerator. On one end is a medium-pore ceramic diffuser/aerator and on the other end a connector. To use, simply wiggle out the entire diffuser that came with your unit from the hose coming out of the PortaZone. Then insert the connector end of the Olive Oil Extension into the empty hose coming out of your PortaZone unit and you are ready to go! Use this type of diffuser for washing fruits and vegetables, ozonating bath water, etc.. These diffusers can also be cleaned but should be replaced appox. every 6 months. If used in oil it will need to be replaced more often. After using your diffuser in olive oil place it in the freezer to prolong it's life by hindering the oil to become rancid. You do not need a diffuser at all if you are ozonating the air. Detaches For Easy Clean-Up. Make micro bubbles, Great for ozonating vegetables, water, bath, foot soak, etc. 3.75” diameter. Warranty is void outside USA. This unit works on 120 v only. If you use the unit in a country where 220 v is used please use a transformer. Warning: Keep the ozonator away from children. Never put the hose into your mouth in order to breath the ozone directly from the unit. Do not use if pregnant or nursing. PortaZone ozone generator. Disclaimer - The Portazone ozone generator is a non-medical device. For research only. Not approved by FDA. This unit is intended solely for use as a water and air treatment device . Any use to the contrary is at the sole risk and responsibility of the user. The Manufacturer and its agents specifically disclaim responsibility for any illegal application or use of this unit. Any statements about ozone, PortaZone ozonators, water purifiers, and others topics are for information only, and not medical advice.